3,596 stock photos, vectors, and illustrations are available royalty-free. 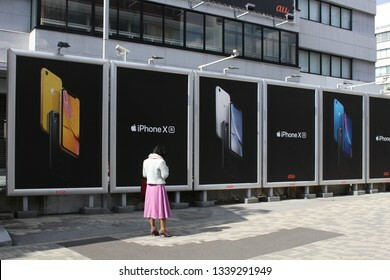 TOKYO, JAPAN - March 14, 2019: A line of billboards advertising iphones and cellphone service provider au in the Tokyo's Omotesando area. 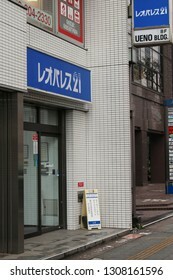 CHIBA, JAPAN - December 27, 2018: A branch of Sumitomo Mitsu bank in Chiba City. 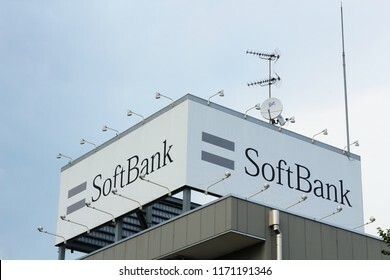 CHIBA, JAPAN - August 29, 2018: Advertsing on the roof of a branch of the Japanese telecommunications company Softbank in Chiba City's Inage area. 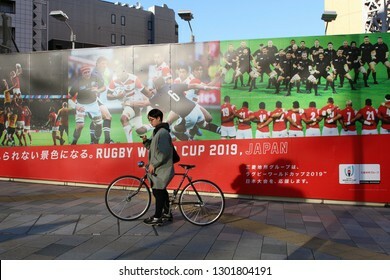 TOKYO, JAPAN - January 27, 2019: A cyclist checks his phone on an Aoyama street corner in front of a billboard advertising the 2019 Rugby World Cup. 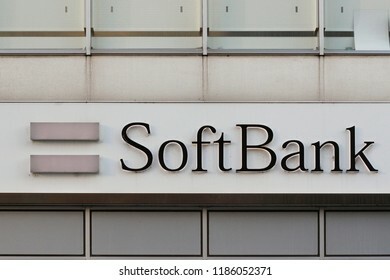 CHIBA, JAPAN - September 23, 2018: The sign above a branch of the Japanese telecommunications company Softbank in Chiba City. 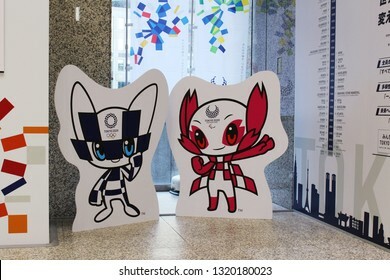 TOKYO, JAPAN - February 7, 2019: An exhibition display with the Tokyo Olympic and Paralympic mascots, Miraitowa & Someity, at the Tokyo Metropolitan Government Building. 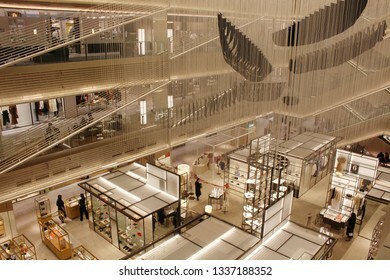 TOKYO, JAPAN - March 8, 2019: View of the interior of Tokyo's Ginza Six shopping complex including an installation, 'Six Ships', by Chiharu Shiota. 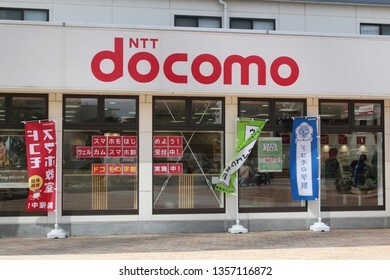 TOKYO, JAPAN - March 27, 2019: A branch of the cellphone service provider NTT DOCOMO located in Tokyo's Koto Ward's Kiba area. 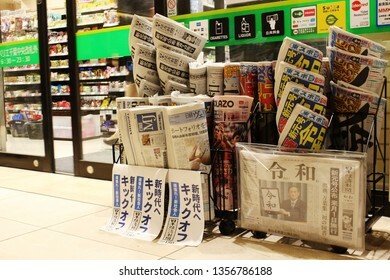 CHIBA, JAPAN - April 2, 2019:Newspapers, some with headlines on the announcement of 'Renwa' as the new Japanese imperial era name (gengo), in a rack by a NewDays convenience store in a train station. 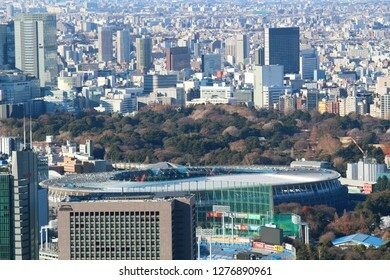 TOKYO, JAPAN - March 8, 2019: Overhead view of the under-construction National Stadium being built for the 2020 Olympics. 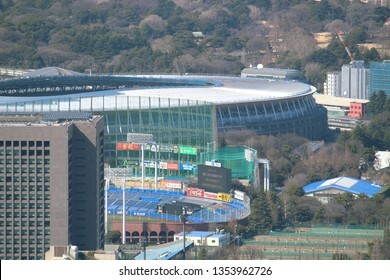 The Meiji Jingu Stadium is in the foreground. 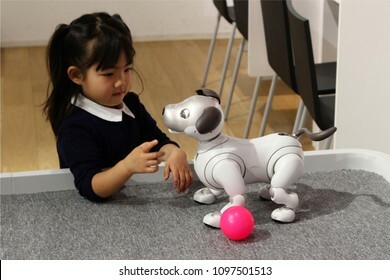 TOKYO, JAPAN - March 30, 2018: A Sony Aibo robot meets a visitor interact in a Sony showroom in Tokyo. 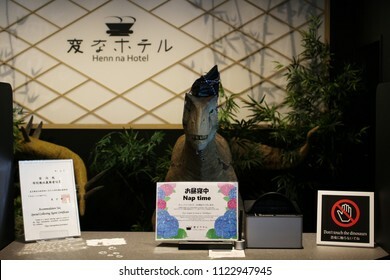 TOKYO, JAPAN - May 30, 2018: A dinosaur robot receptionist, one of a pair, on the reception desk of a Henn Na Hotel in Kasai. The hotel uses a variety of robots and is owned by H.I.S. hotel chain. TOKYO, JAPAN - January 3, 2019: Overhead view of the National Stadium being built for the 2020 Olympics and Tokyo's skyline at the beginning of 2019. TOKYO, JAPAN - January 4, 2019: A Ministop convenience store in Ichigaya in Tokyo's Chiyoda Ward.. Ministop is part of the Aeon group. 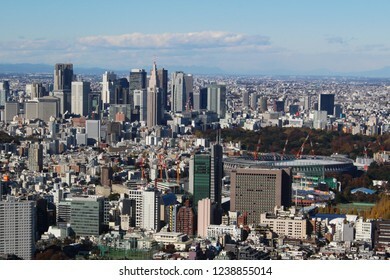 TOKYO, JAPAN - November 23, 2018: View of Tokyo's skyline from Roppongi Hills with under-construction National Stadium which will be used for the 2020 Olympics and Shibuya's cluser of skyscraper. 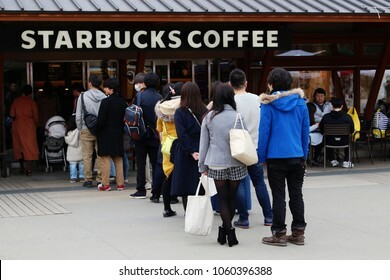 TOKYO, JAPAN - March 3, 2018: A long line of customers outside a busy Starbucks branch in Tokyo's Ueno Park. 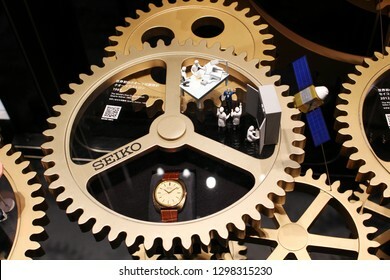 TOKYO, JAPAN - January 13, 2019: A Seiko Astron, the world's first quartz watch, on displayed at the Seiko Watch Museum inside Seiko Dream Square. 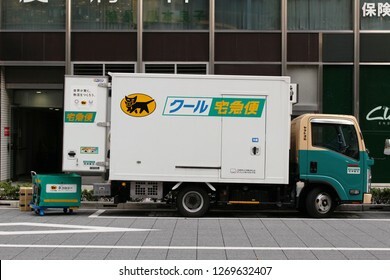 TOKYO, JAPAN - December 7, 2018: A Yamato Transport Company (Kuroneko) truck making a delivery in Tokyo's Hibiya area. 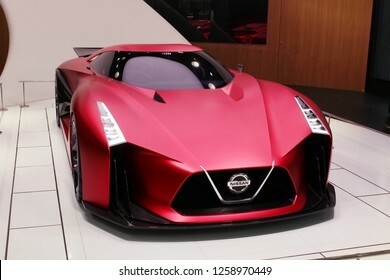 TOKYO, JAPAN - November 17, 2018: A Nissan Concept 2020 Vision Gran Turismo at the Nissan Crossing showroom in Ginza Place. 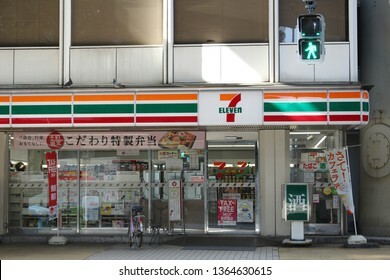 TOKYO, JAPAN - March 21, 2019: The front of a 7-Eleven convenience store located below the Shuto Urban Expressway in Tokyo's Suitengu area. 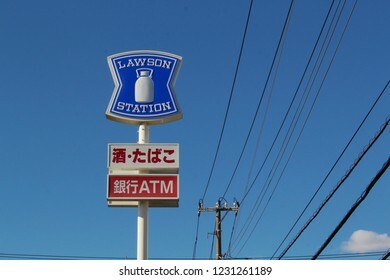 CHIBA, JAPAN - November 15, 2018: The top of a tall sign outside a Lawson convenience store in Chiba city. 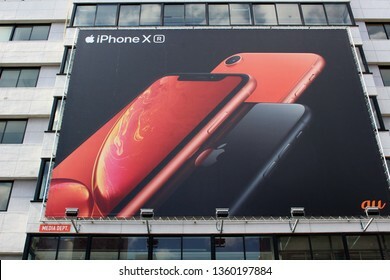 TOKYO, JAPAN - March 14, 2019: The iphone X and cellphone service provider au advertised on a large billboard on the side of a building advertising in the Tokyo's Omotesando area. 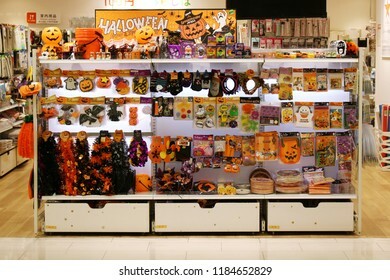 CHIBA, JAPAN - September 15th, 2018: Halloween products on display in a branch Can Do, a 100 yen store (a nationwide Japanese chain variety store where most products cost 100 yen). 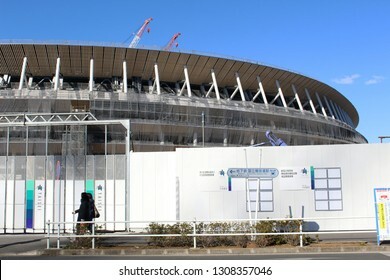 TOKYO, JAPAN - January 27, 2019: View of the under-construction National Stadium being built for the 2020 Olympics. 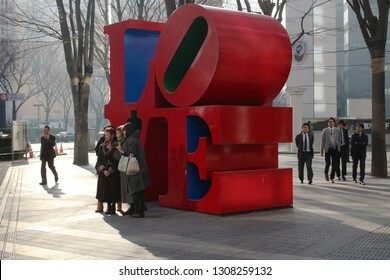 TOKYO, JAPAN - February 7, 2019: A group of visitors have their photo taken in front of a 'Love' sculpture by Robert Indiana installed on a street in Shinjuku on a sunny winter's day. 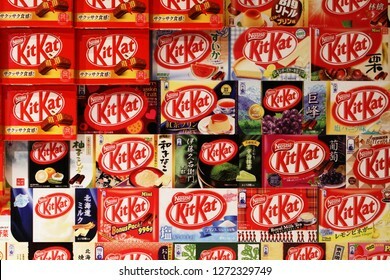 TOKYO, JAPAN - December 22, 2018: A display of boxes which contained special Kitkat flavors in Chocolatory in Ginza, a specialist Kitkat chocolate store / cafe. 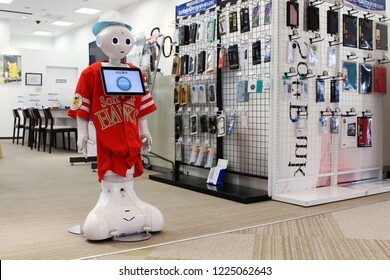 CHIBA, JAPAN - June 6, 2018: A Softbank Pepper robot on customer service duty at the front of a Softbank. It's wearing a Softbank Hawks uniform, a baseball team sponsored by the company. 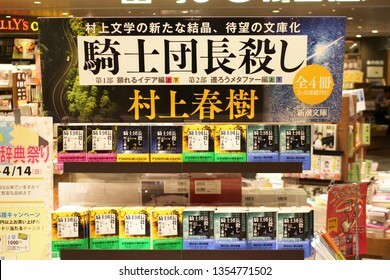 CHIBA, JAPAN - March 29, 2019: A Chiba City's bookstore display of a new small-format paperback edition (bunkobon) of Haruki Marakami's Killing Commendatore which is spread over four volumes. 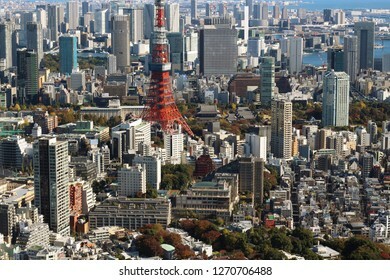 TOKYO, JAPAN - November 23, 2018: Overhead view of the Tokyo's skyline, including the lower half of the Tokyo Tower, with Tokyo Bay in the background. TOKYO, JAPAN - October 13, 2018: Pedestrians using a busy crosswalk in front of Nihonbashi's Takashimaya department store. 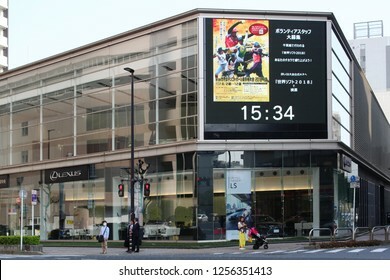 TOKYO, JAPAN - November 23, 2018: View of Tokyo's Roppongi Hills complex with large poster advertsing a movie. 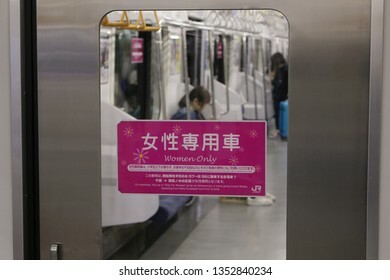 TOKYO, JAPAN - March 27, 2019: A notice on a JR Sobu Line (local) train door indicating that during the morning rush hour the carriage is for women only. Photograph taken at night. 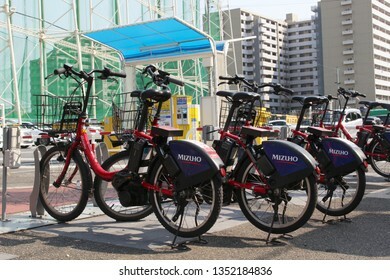 TOKYO, JAPAN - March 27, 2019: Electric bikes belonging to Toyko's public bicycle sharing scheme parked outside a golf practice range in Tokyo's Koto Ward. 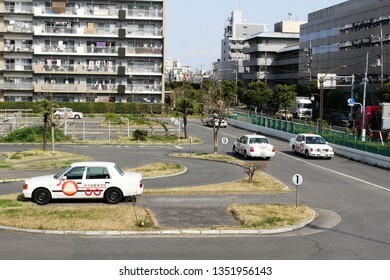 TOKYO, JAPAN - March 27, 2019: View of a Tokyo Chuo driving school with drivers training on its the training course. 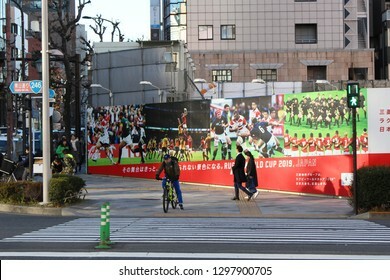 TOKYO, JAPAN - January 27, 2019: A street corner in Tokyo's Gaienmae area with a billboard advertsing the 2019 Rugby World Cup in front of a construction site. 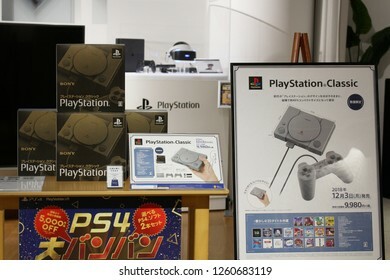 TOKYO, JAPAN - December 7, 2018: The Sony Playstation Classic in a Sony store. 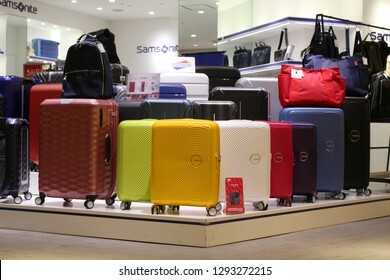 CHIBA, JAPAN - December 4, 2018: View of a Samsonite shop located in a Chiba City department store. 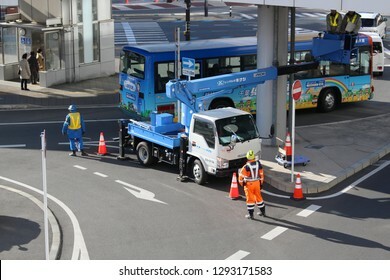 CHIBA, JAPAN - January 22, 2019: A footbridge linked to Chiba Station being inspected by workers using a crane truck. 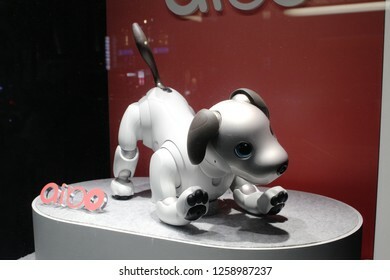 TOKYO, JAPAN - December 7, 2018: An Aibo robot dog in a showroom window. 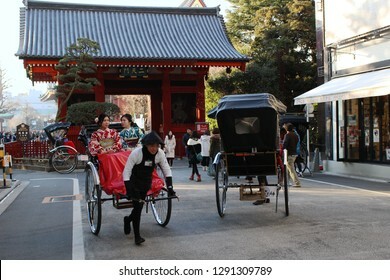 TOKYO, JAPAN - January 19, 2019: Visitors riding in a rickshaw in Asakusa with Nitenmon Gate in the background. 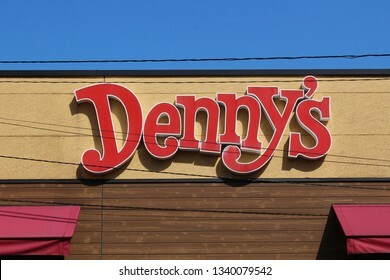 CHIBA, JAPAN - March 15, 2019: The sign on a Denny's restaurant in Chiba City. 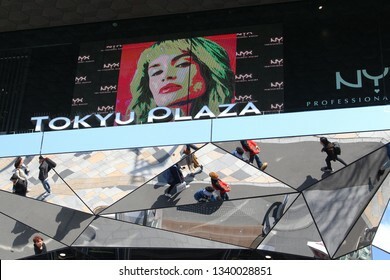 TOKYO, JAPAN - March 14, 2019: Section of the front of Tokyu Plaza Omotesando shopping center with an NYX advert playing on a large screen and the street below relected in kaleidoscopic mirrors. CHIBA, JAPAN - April 4, 2018: View of a Toyota Lexus showroom in Chiba City which has a giant screen. The ad on it is for volunteers to help at the WBSC Women's Softball World Championship 2018. 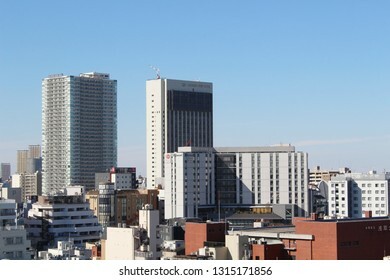 CHIBA, JAPAN - December 4, 2018: View of a multi-purpose building's (shopping centre, apartments etc.) 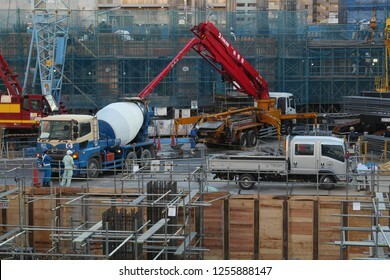 construction site in Chiba City including a cement mixer truck & concrete pump. 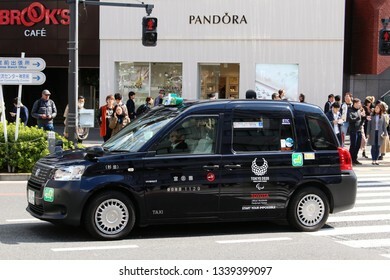 TOKYO, JAPAN - March 14, 2019: A Toyota JPN Taxi with Tokyo Olympic 2020 logo going through Tokyo's Omotesando area. 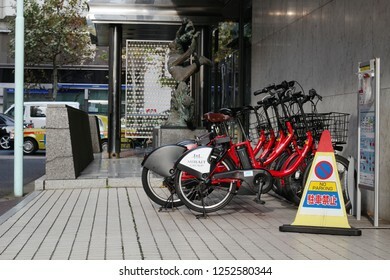 TOKYO, JAPAN - August 3, 2018: E-bikes belonging to Toyko's public bicycle sharing scheme in a parking area in front of a designated smoking zone in Tokyo's Toranomon area. 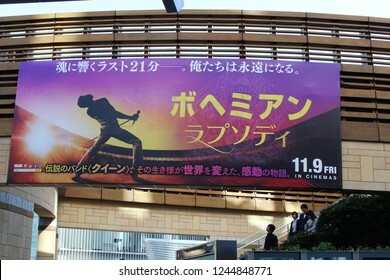 TOKYO, JAPAN - March 8, 2019: A billboard at Yahoo! Japan's Bosai Diversity disaster preparation event in Roppongi Hills. 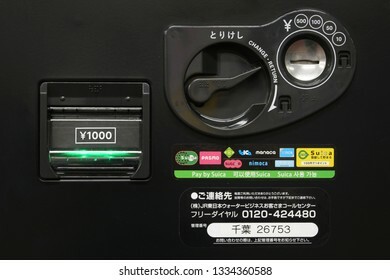 TOKYO, JAPAN - March 10, 2019: Detail of a drinks vending machine with slots for coins and banknotes and the logos of IC cards which the machine accepts. 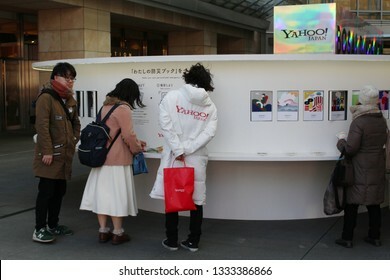 TOKYO, JAPAN - March 8, 2019: View of Yahoo! 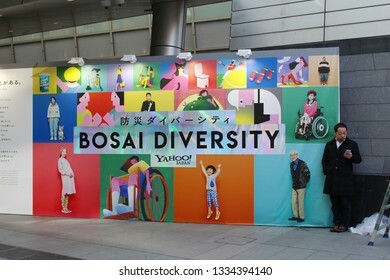 Japan's Bosai Diversity disaster preparation event in Roppongi Hills. 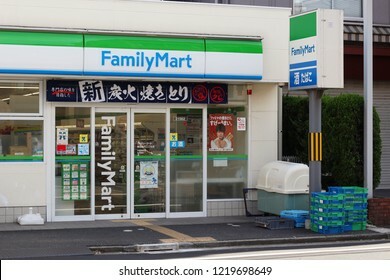 TOKYO, JAPAN - August 18, 2018: A Familymart convenience store in Tokyo's Sumida Ward. 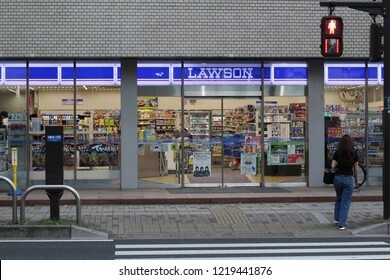 CHIBA, JAPAN - August 19, 2018: The front of a large Lawson convenience store in central Chiba City in the early evening. 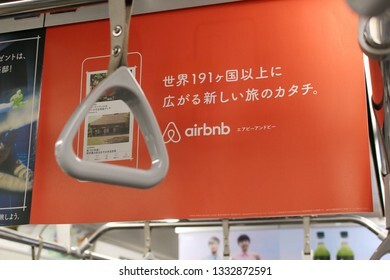 TOKYO, JAPAN - March 8, 2019: A hanging strap and a poster advertising airbnb inside a Tokyo subway train. Focus is on the advert. 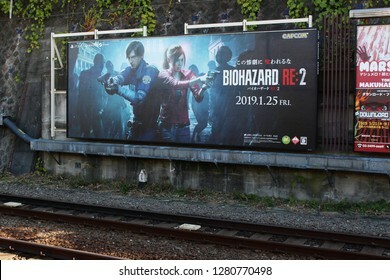 TOKYO, JAPAN - January 4, 2019: Billboards and railway tracks seen from the platform at Ichigaya JR train station in Tokyo. 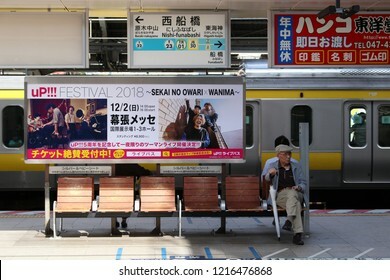 CHIBA, JAPAN - October 27, 2018: A Nishi Funabashi station platform. The station serves both the Tokyo Metro subway system as well as various overground lines. A moving JR train is in the background. 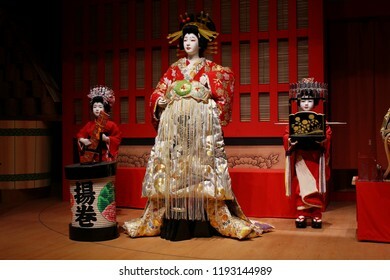 TOKYO, JAPAN - August 18, 2018: Figures on a stage which of part of a Kabuki exhibit at Tokyo's Edo-Tokyo museum. 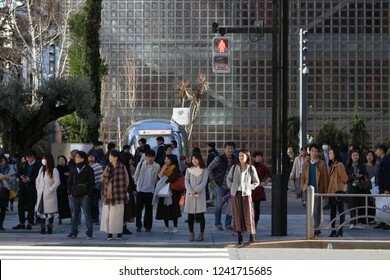 TOKYO, JAPAN - November 23: People waiting to use the Sukiyabashi scramble crossing in front of Ginza's Sony Park with the Renzo Piano-designed Hermes building in the background. 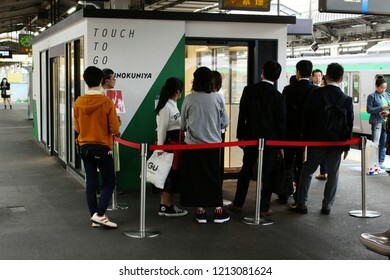 TOKYO, JAPAN - October 26, 2018: Customers waiting outside pop-up store w/ Kinokuniya, a cashless convenience store (like Amazon GO) on a JR train platform. Payment made using IC card or smartphone. 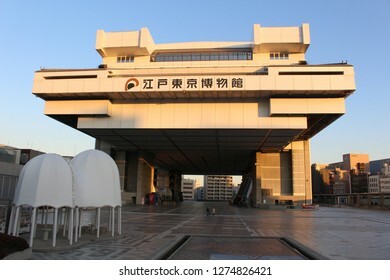 TOKYO, JAPAN - January 4, 2019: View of the Kiyonori Kikutake-designed Edo-Tokyo museum in Ryogoku. Some lens / perspective distortion. 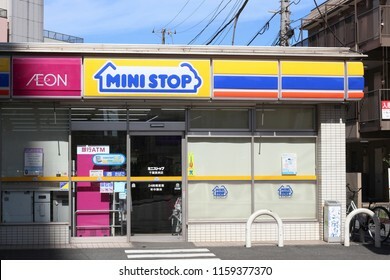 CHIBA, JAPAN - August 14, 2018: A Chiba City Ministop convenience store. 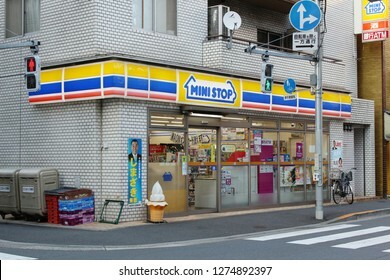 Ministop, part of the Aeon group, is Japan's 4th largest convenience store chain behind 7-Eleven, Familymart & Lawson (3/20). 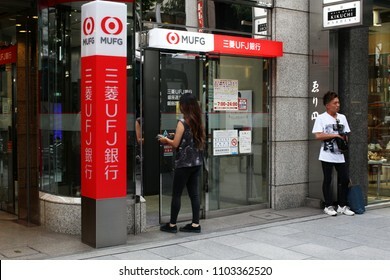 TOKYO, JAPAN - June 1, 2018: A customer entering a Ginza branch of the bank Tokyo-Mitsubishi UFJ in Tokyo. 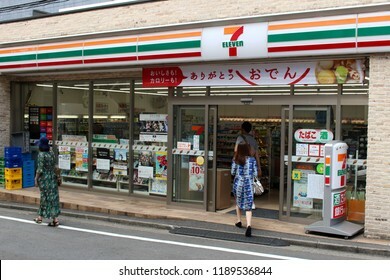 TOKYO, JAPAN - September 8, 2018: Customers enter a modern 7-Eleven convenience store in Aoyama in Tokyo's Minato Ward. 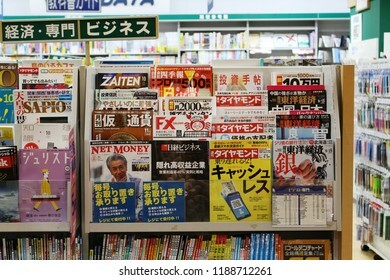 CHIBA, JAPAN - September 25, 2018: Business and economics magazine on a rack in a bookstore. 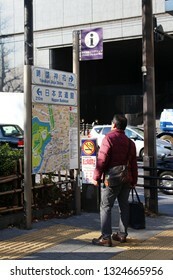 TOKYO, JAPAN - January 17, 2019: A visitor looks at a a street map in Kudanshita with signs above it showing the way to Nippon Budokan and Yasukuni Jinja Shrine. 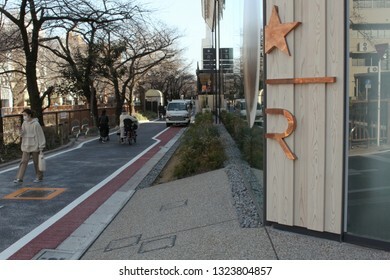 TOKYO, JAPAN - February 23, 2019: View of the side and of the Kengo Kuma-designed Starbucks Reserve Roastery in Tokyo and an adjoining street. 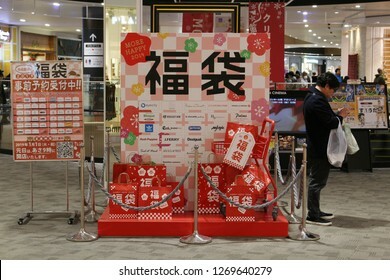 CHIBA, JAPAN - December 9, 2018: A display promoting new year Lucky Bags (Fukubukro) in an Aeon Mall in Makuhari, Chiba City. 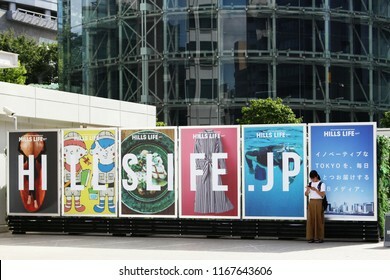 TOKYO, JAPAN - August 28, 2018: A visitor in Roppongi using a smartphone stands in front of line of billboards advertising the Hills Life website. Roppongi Hills is in the background. 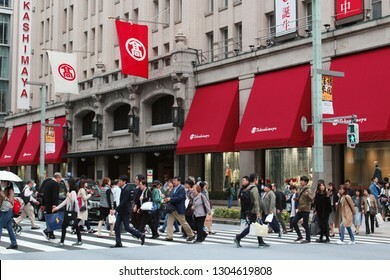 TOKYO, JAPAN - August 9, 2018: A large GU clothes store and the crowded sidewalk in front of it in Ginza in central Tokyo. 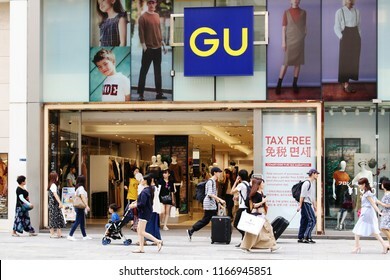 GU is owned by Fast Retailing which also owns Uniqlo. 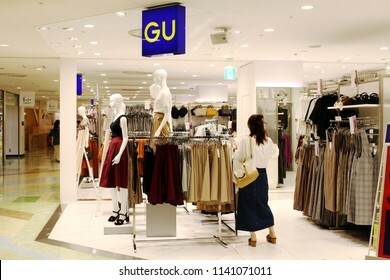 CHIBA, JAPAN - July 19, 2018: A shopper in the women's clothes in a GU store in Funabashi's Lalaport shopping mall. GU is owned by Fast Retailing which also owns Uniqlo. 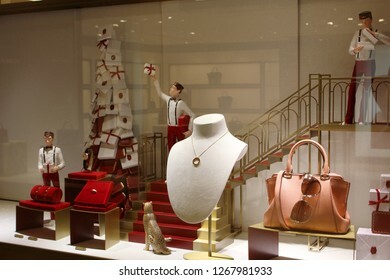 CHIBA, JAPAN - December 4, 2018: A Christmas-themed window display in a Cartier store. Selective focus. 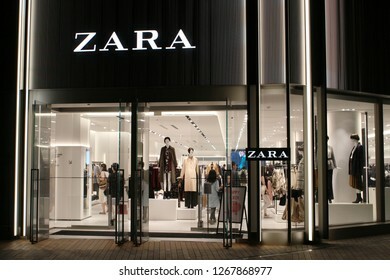 TOKYO, JAPAN - September 16, 2018: The entrance and interior of a Zara clothes store in Toyko's Roppongi Hills at night. 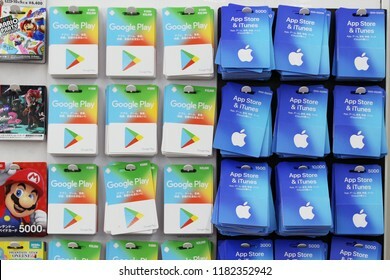 TOKYO, JAPAN - September 16, 2018: A 7-Eleven convenience store's racks with various types of prepaid gift cards including Google Play and Apple's App & iTunes stores. 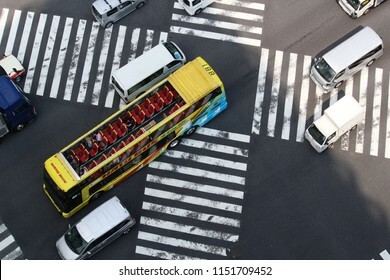 TOKYO, JAPAN - August 3, 2018: Overhead view of vehicles, including an open top Hato tour bus, crossing Ginza's Sukiyabashi scramble crossing on a extremely hot summer's day. Some motion blur. 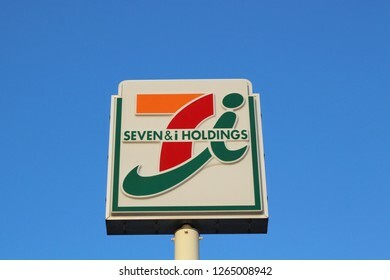 CHIBA, JAPAN - November 11, 2018: The top of a tall sign located outside a 7-Eleven convenience store. 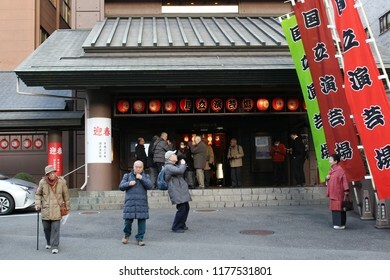 TOKYO, JAPAN - January 12, 2018: Theatergoers leaving the National Engei Hall. Part of the National Theatre of Japan, the venue stages mostly rakugo & manzai performances. Some motion blur. TOKYO, JAPAN - January 19, 2019: Overhead view of Asakusa includingthe Asakusa View Hotel and the Richmond Hotel. 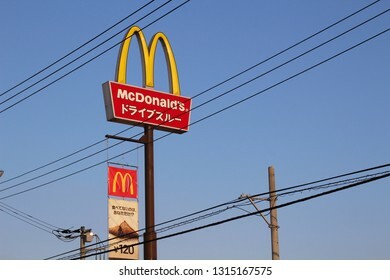 CHIBA, JAPAN - November 11, 2018: A tall sign outside a McDonalds restaurant situated at the side of a busy main road in Sanmu City. The Japanese writing indicates that it's a drive-thru restaurant. 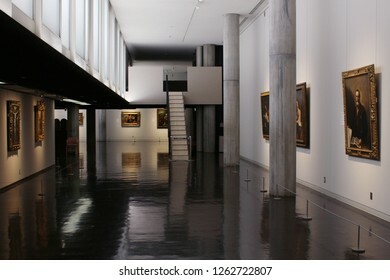 TOKYO, JAPAN - September 30, 2017: View of a gallery in Tokyo's National Museum of Western Art. 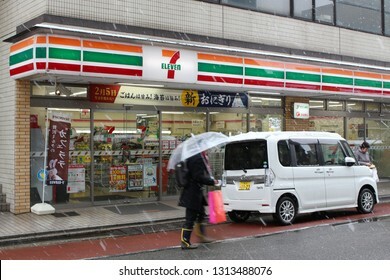 CHIBA, JAPAN - February 11, 2019: The front of a 7-Eleven convenience store in Chiba City on a snowy day. 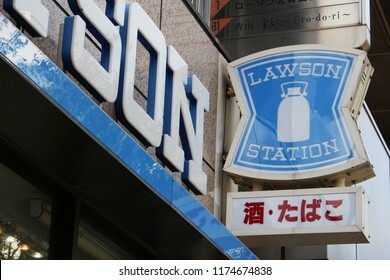 TOKYO, JAPAN - June 19, 2018: The sign attached to a Lawson convenience store in Tokyo's Shibuya area. 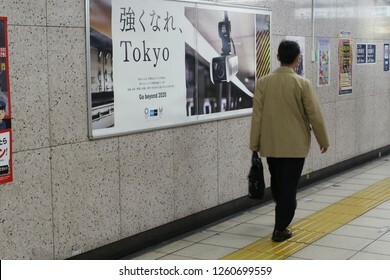 TOKYO, JAPAN - December 7, 2018: A Tokyo Olympic-related poster in Yurakucho subway station trumpeting the increase in the number of security cameras installed on the subway system to make it safer. 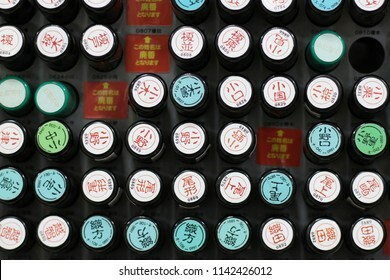 CHIBA, JAPAN - May 2, 2018: Low-cost Japanese name stamps (hanko) in a branch of a Daiso 100 yen store (a nationwide Japanese chain variety store where most products cost 100 yen). 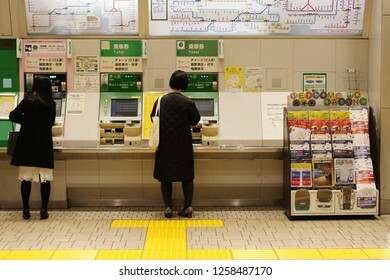 TOKYO, JAPAN - December 7, 2018: Passengers using ticket vending / IC card charging machines at Yurakucho Station in central Tokyo. 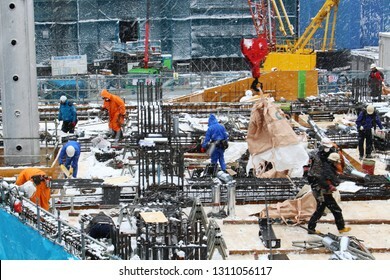 CHIBA, JAPAN - February 11, 2019: Workers on a construction site for a large multi-purpose building (shopping centre, apartments etc.) in Chiba City during heavy snowfall. Some motion blur. 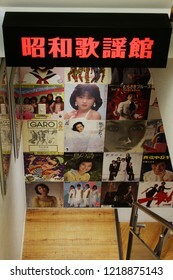 TOKYO, JAPAN - October 26, 2018: View of the staircase leading to Disk Union Showa Kayo-Kan, a second-hand record store specializing in a variety of Japanese music from the Showa Period (1926-1989). 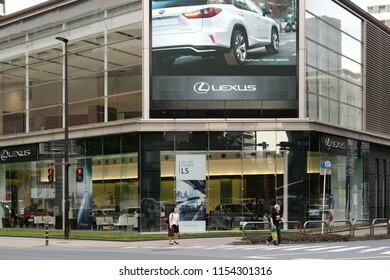 CHIBA, JAPAN - July 12, 2018: View of a large Toyota Lexus showroom in Chiba City which has a giant screen which shows adverts and displays public information. 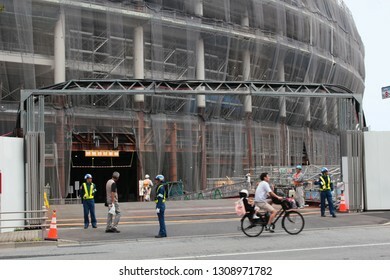 TOKYO, JAPAN - May 26, 2018: View of an entrance to the under-construction Kengo Kuma-designed 2020 Tokyo Olympic Stadium. Some motion blur. 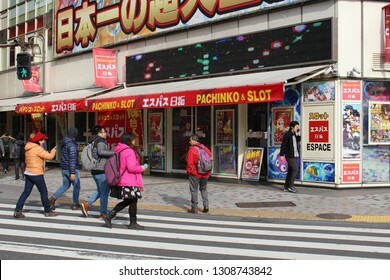 TOKYO, JAPAN - February 7, 2019: A pachinko and slot center on the corner of a street in Shinjuku. 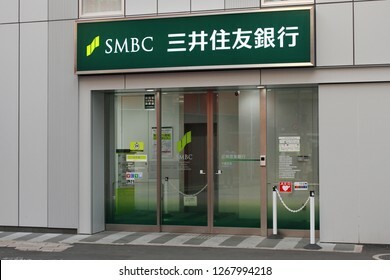 CHIBA, JAPAN - February 9, 2019: A branch of the property company Leo Palace 21 in Chiba City. 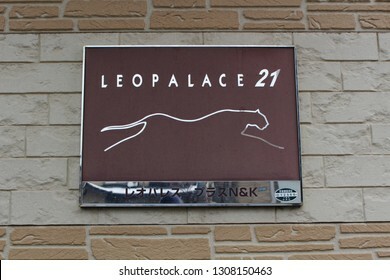 CHIBA, JAPAN - February 9, 2019: A sign on the wall of a Leo Palace 21 apartment block in Chiba City. 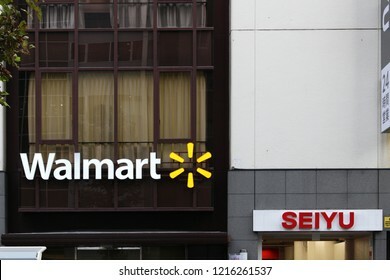 TOKYO, JAPAN - October 26, 2018: Signs on the front of branch of the supermarkt chain Seiyu, one for Seiyu, the other for its owner Walmart, in Akabane in Tokyo. 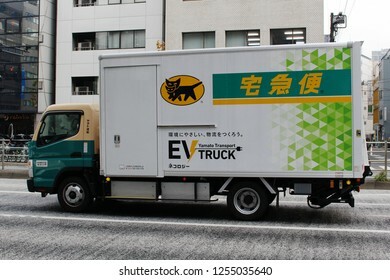 TOKYO, JAPAN - December 7, 2018: A Yamato Transport Company (Kuroneko) Mitsubishi Fuso Truck and Bus Corporation EV truck in Kayabacho. 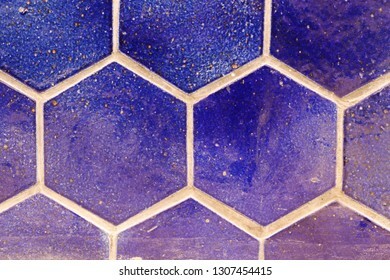 Close-up of hexagonal wall tiles. 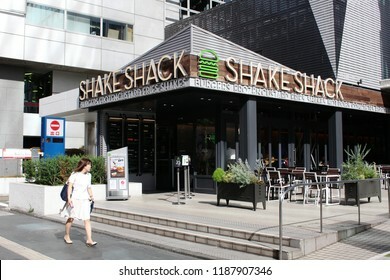 TOKYO, JAPAN - August 15, 2018: A Shake Shack fast food restaurant in Roppongi in central Tokyo. 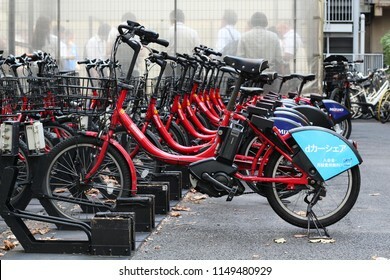 TOKYO, JAPAN - December 7, 2018: A row of electric bikes belonging to Toyko's public bicycle sharing scheme parked outside an office building in Kayabacho in central Tokyo. 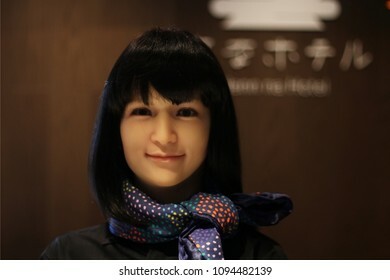 TOKYO, JAPAN - June 17, 2018: Robot receptionists on the reception desk of a Henn Na Hotel in Ginza. The hotel uses robots and is owned by H.I.S. hotel chain. Shallow depth of field. 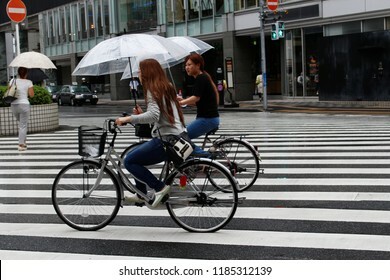 CHIBA, JAPAN - September 6, 2017 - A pair of cyclists sheltering from the rain under umbrellas while riding through downtown Chiba City. Some motion blur. 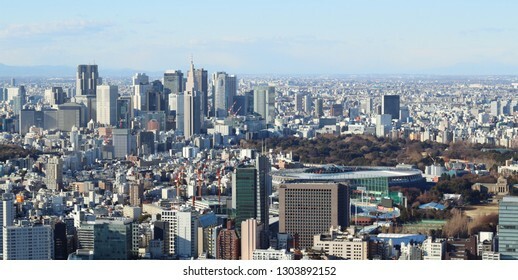 TOKYO, JAPAN - January 3, 2019: Overhead view of Tokyo's skyline including the National Stadium being built for the 2020 Olympics and skyscrapers in Shinjuku. 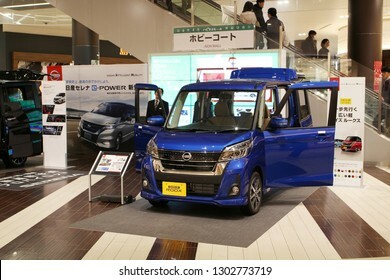 CHIBA, JAPAN - December 9, 2018: A Nissan DAYZ ROOX on display in an Aeon Mall in Makuhari, Chiba City. 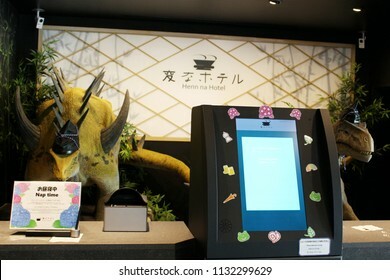 TOKYO, JAPAN - May 30, 2018: A pair of Dinosaur robots working on reception desk of a Henn Na Hotel in Kasai. The hotel uses various robots & is owned by H.I.S. hotel chain. Shallow depth of field.